Rental Date: Please note that due to the high demand, the Pocket WiFi will only be available to rent from April 19th. Travelling to another country often means very different experiences for the different individuals. Some prefer to take millions of pictures and share them immediately with their friends and family, while others prefer to save everything and share it when the right moment comes. No matter how you prefer to live your favourite moments, we have just the right device to make your stay in Japan a trip to remember! 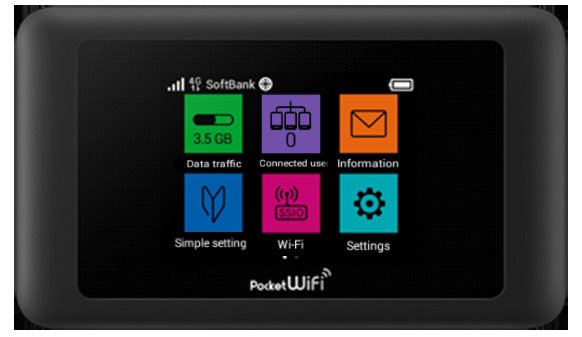 Order your portable Pocket WiFi now and never lose track of what is happening at any time! The small size of the device allows for it to fit anywhere, even in your pocket. This means that if you decide to go for a walk, without any hand luggage you will not need to worry about whether or not you will be able to stay connected. Thanks to its small size, the Pocket WiFi will fit even in the smallest pockets. Where do I pick up the Pocket WiFi? When you order your Pocket WiFi online, you will be asked when and how you prefer to have it delivered. You can choose to pick it up at your arrival airport or at your hotel in Japan. Check out our instructions in PDF to see the pick-up locations. How do I return the Pocket WiFi? Once your trip is over you may return the WiFi device via the prepaid envelope, which you will have received together with the device. You should mail the envelope, before your departure from Japan, in any Japanese Post Office/Postal Box. What happens if I return late the device? In case you do not return the device on time, we receive the right to charge your debit/credit card for the damage. This means that for each delayed day you will be charged ￥400. What happens if I lose the device? If you have lost the device you will be charged a flat fee of ￥20,000.